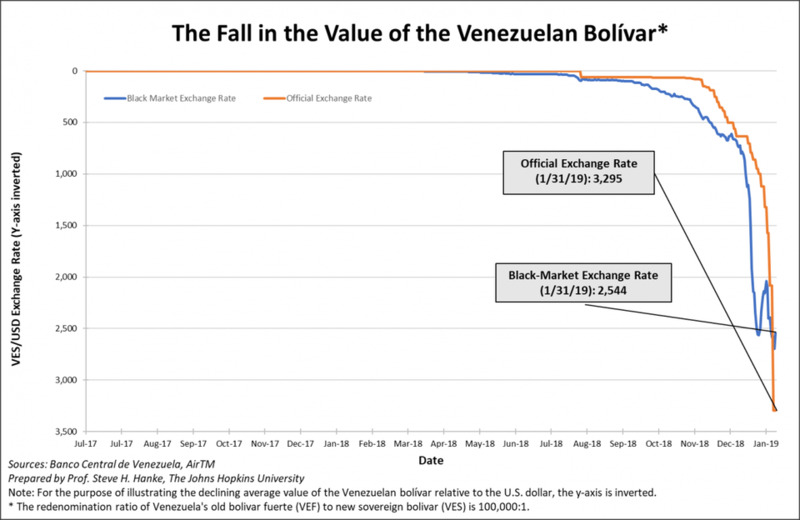 Thanks to the collapse of the Bolivar, Venezuela has earned the dreadful distinction of being the world’s only country that is experiencing hyperinflation. Today, its annual inflation rate is 121,583%/yr (see the accompanying chart). 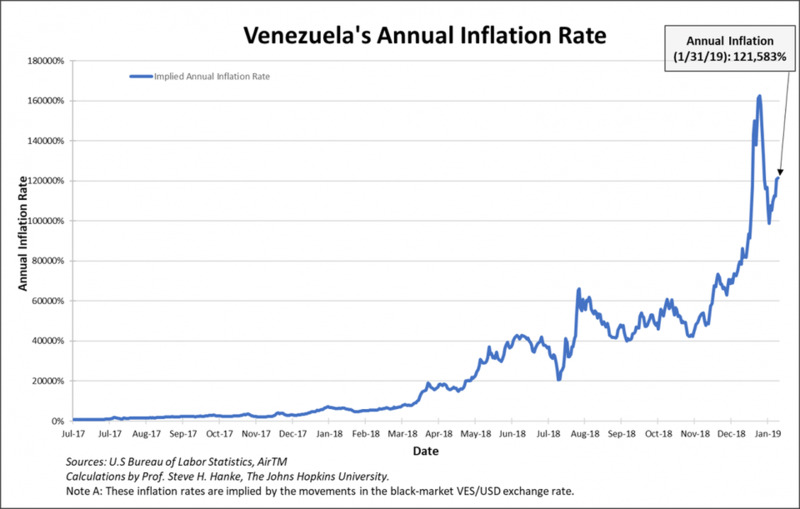 By hyperinflation standards, that’s a relatively mild rate, putting Venezuela at the 23rd rank out of the world’s 58 episodes of hyperinflation. What makes Venezuela’s hyperinflation so brutal is that it has lasted for 27 months. Only four of the 58 episodes recorded in history have lasted longer. So, it’s clear what Venezuela’s big problem is: hyperinflation. The first order of business for any new government in Venezuela is to slay the hyperinflation dragon. This can be done within 24 hours with the introduction of a currency board. A currency board issues notes and coins convertible on demand into a foreign anchor currency at a fixed rate of exchange. As reserves, it holds low-risk, interest-bearing bonds denominated in the anchor currency. The reserve levels (both floors and ceilings) are set by law and are equal to 100%, or slightly more, of its monetary liabilities. So, the domestic currency issued via a currency board is nothing more than a clone of its anchor currency. A currency board generates profits (seigniorage) from the difference between the interest it earns on its reserve assets and the expense of maintaining its liabilities. Professor of Applied Economics and Co-Director of the Institute for Applied Economics, Global Health, and the Study of Business Enterprise at The Johns Hopkins University; Senior Fellow at the Cato Institute; Distinguished Professor at the Universitas Pelita Harapan in Jakarta, Indonesia; Senior Advisor at the Renmin University of China’s International Monetary Research Institute in Beijing; Special Counselor to the Center for Financial Stability in New York; member of the National Bank of Kuwait’s International Advisory Board; member of the Financial Advisory Council of the United Arab Emirates; contributing editor at Globe Asia magazine. Previously, I taught economics at the Colorado School of Mines and the University of California at Berkeley. I served as a Senior Economist on President Reagan’s Council of Economic Advisers in 1981-82; as a Senior Advisor to the Joint Economic Committee of the U.S. Congress in 1984-86; as a State Counselor to the Republic of Lithuania in 1994-1996 and to the Republic of Montenegro in 1999-2003; and as an Advisor to the Presidents of Bulgaria in 1997-2002, Venezuela in 1995-96 and Indonesia in 1998. I helped to establish new currency regimes in Argentina, Estonia, Bulgaria, Bosnia-Herzegovina, Ecuador, Lithuania and Montenegro. I advised the governments of many other countries, including Albania, Kazakhstan and Yugoslavia. Currently serve as Chairman of the Richmond Group Fund Co., Ltd., a global macro hedge fund located in Richmond, Virginia. I am Chairman Emeritus of the Friedberg Mercantile Group, Inc. in Toronto. During the 1990s, I served as President of Toronto Trust Argentina in Buenos Aires, the world’s best-performing emerging market mutual fund in 1995.